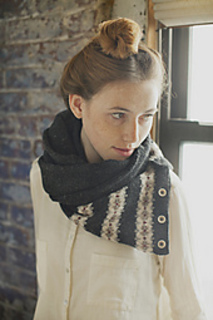 The simple addition of buttons to this traditional Shetland scarf shape updates it with new versatility. 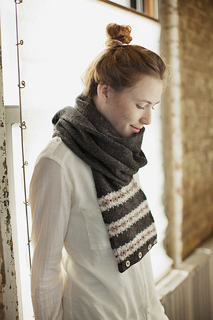 Oslo is a tubular scarf with decorative colorwork motifs at each end and a buttoned seed-stitch hem. 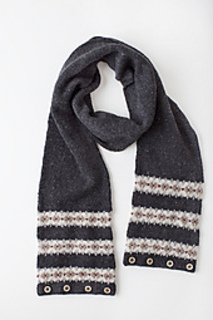 Buttons are sewn onto the inside of the tube and inserted through the buttonholes to close the tube; the buttons can also be used to affix each end of the scarf together, creating many creative options for wear. 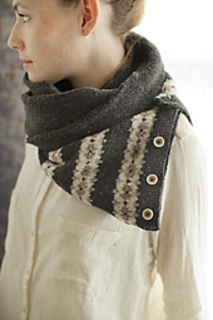 We like to button one corner from each end together to create a cowl-like fit (shown on the pattern’s cover). 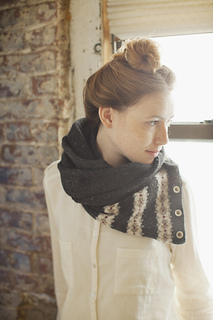 Because the scarf is tubular it is thick and warm, while remaining light – thanks to Loft’s soft-spun construction – it’s a classy way to keep warm!